With a wide variety to choose from, we have something for everyone. 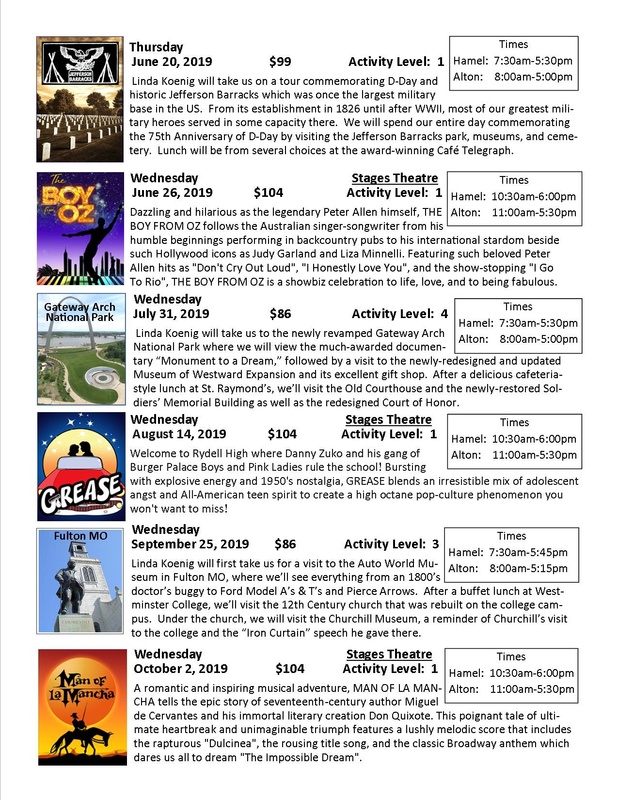 For more information about our events and activities, contact us at (618)-465-3298 ext. 123. A deposit fee of 50% is due upon booking. Fifty percent of fees are due 30 days prior to the event. Rental fees are nonrefundable without written/verbal notification no later than 15 days prior to the event. Meeting rooms are available Monday to Friday, from 8:00 AM to 7:00 PM. Any reservation made outside the normal business hours will require an adjusted hourly rate. Rooms are available until 9:00 PM daily and from 8:00 AM to 6:00 PM on Saturday and Sunday. Kitchen use includes sinks and ice only. No use of stoves or ovens is allowed. No outside food is allowed into the facility. No alcoholic beverages are allowed at the facility. SSP does not provide glassware, plastic, or silverware unless notified (fee will apply). White linen table covers are available for rent at $3.50 each. Plastic table covers of any color are available for $2.00 each. You are welcome to bring in outside decorations but are responsible for cleanup. In year-end evaluations, teachers reported that 88% of students assigned to a Foster Grandparent improved their reading performance and 91% of students improved their overall academic performance. There are no educational requirements to become a Foster Grandparent, and volunteers donate between 15 to 40 hours per week at their assigned school. They act as role models by being a dependable and positive influence on children as they provide support, encouragement, and empathy throughout the school day. The Foster Grandparent Program is funded by the Corporation for National and Community Service and the Illinois Department on Aging. It is sponsored locally by Senior Services Plus, Inc. in Alton. For more information about the Foster Grandparent Program, contact the program coordinator. Foster Grandparents are role models, mentors, and friends to children with exceptional needs. The program provides a way for volunteers aged 55 and over to stay active by serving children and youth in their communities. Help children learn to read and provide one-on-one tutoring. Mentor troubled teenagers and young mothers. Care for premature infants or children with disabilities. Help children who have been abused or neglected. While the children benefit from the extra attention they receive from the volunteers, the teachers appreciate the extra help in the classroom, including the positive influence of an older role model. School administrators report that these volunteers influence children in many critical areas not reflected on test scores, such as the ability to build trust in a child, bring a child out of his or her shell, instill confidence in a child, and teach a child how to show patience, respect, and consideration for others. All you need to join is the ability to give the kind of comfort and love that sets a child on the path toward a successful future. If you’re 55 or older and want to share your experience and compassion, you have what it takes to be a Foster Grandparent. Foster Grandparents serve from 15 to 40 hours per week in locations including schools, hospitals, juvenile correctional institutions, daycare facilities, or Head Start centers. The program is open to all U.S. citizens, nationals, or lawful permanent resident aliens 55 years of age and over. Volunteers receive pre-service orientation, training from the organization where you will serve, supplemental accident and liability insurance, and meals while on duty. Volunteers who meet certain income guidelines also receive a small stipend. Remember: When you volunteer, you’re not just helping others but you’re helping yourself. Volunteering leads to new discoveries and new friends. Plus, studies show that volunteering helps you live longer and promote a positive outlook on life. So get involved, and join Foster Grandparents today! 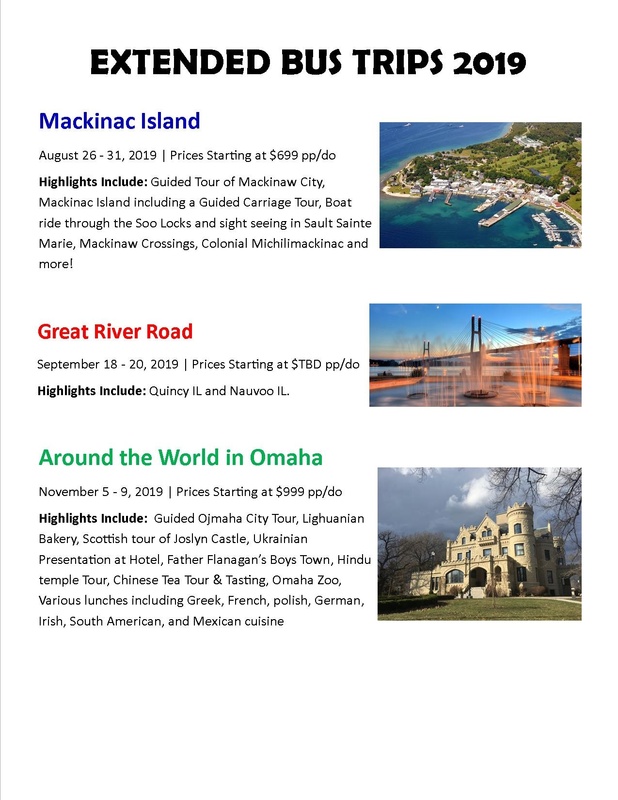 Our travel program at Senior Services Plus, Inc. travels around the state, the country, and the world. We offer safe and affordable trips with comfortable transportation. We handle all reservations to take the hassle out of traveling. 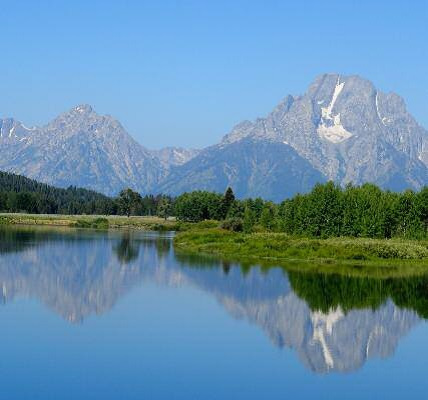 Tour groups have visited beautiful places in Europe, Central America, Hawaii, Alaska, Ireland, Texas, and Canada. 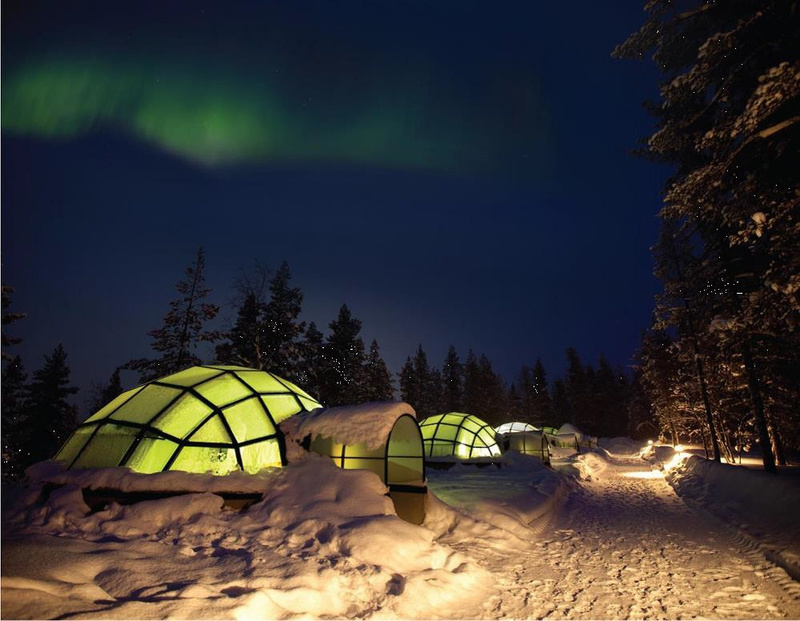 Closer-to-home destinations have included casino trips, stage performances, cultural events, and other local towns. Follow us on Facebook for up to date presentations, images, and upcoming travel! 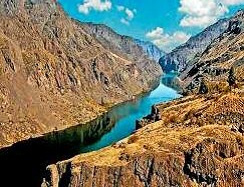 Cruise the Columbia & Snake Rivers along the epic route pioneered by Lewis and Clark aboard the paddlewheeler American Empress. Come find out about the fabulous French Riviera with its elegant coastal resorts, superb eateries, chic boutiques and captivating museums. Join us to learn about the lush forests and stunning waterfalls, exotic wildlife and endless coastlines. Information about our most recent/upcoming Day Trips will always be posted here. Trips may become sold out at any minute. 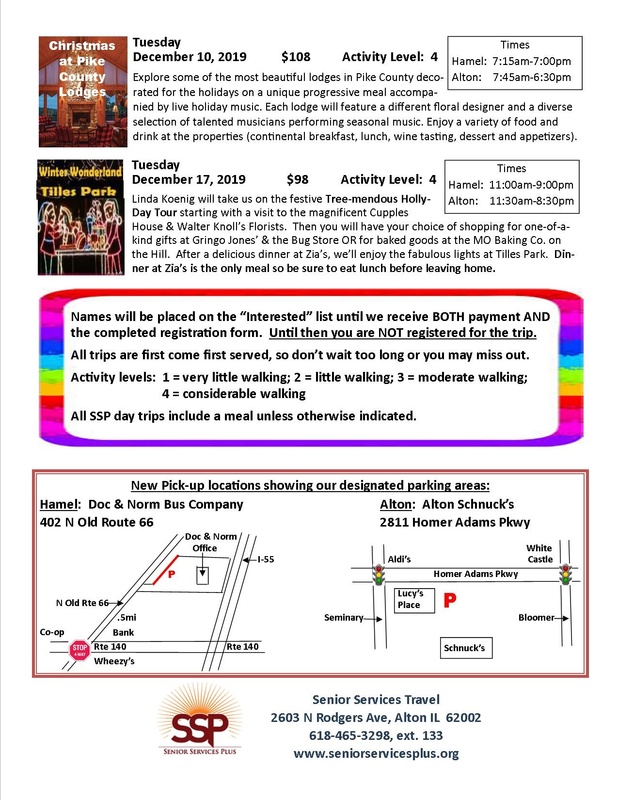 Please contact Senior Services Plus, Inc. to discuss trip availability and reservations. 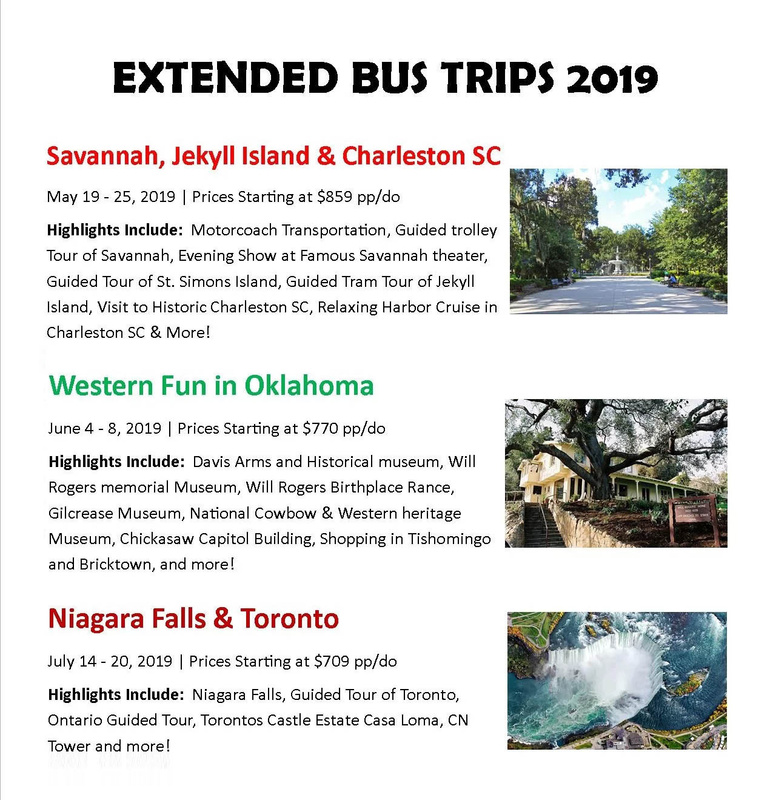 Information about our most recent/upcoming Extended Trips will always be posted here. Trips may become sold out at any minute. 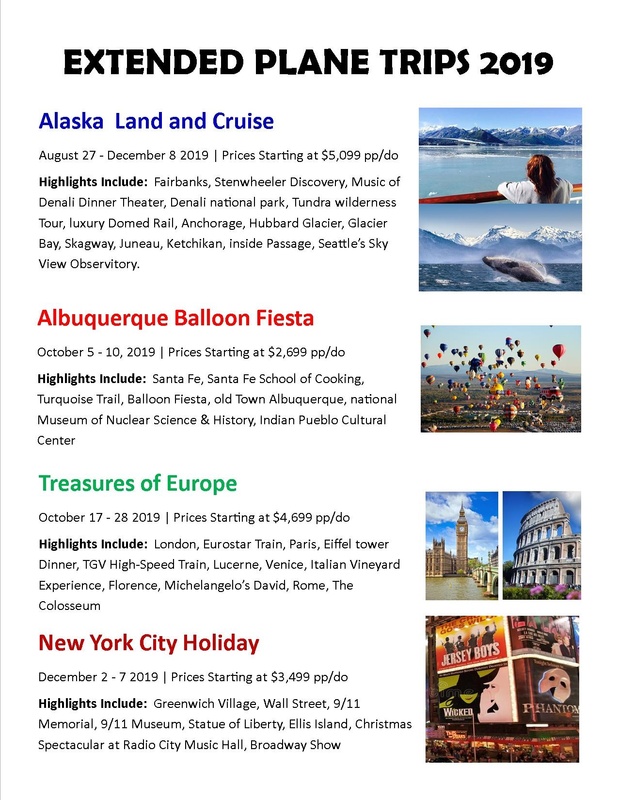 Please contact Senior Services Plus, Inc. to discuss trip availability and reservations. Call 618-465-3298 ext. 133. 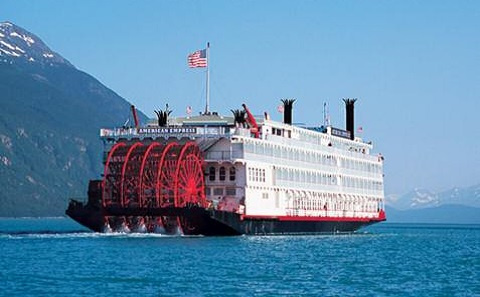 Highlights Include: Cruise on a Paddle wheeler down the Columbia & Snake Rivers. 6 Ports of Call with hop-on/hop off excursions, Broadway style Entertainment nightly, daily Riverlorian lectures. 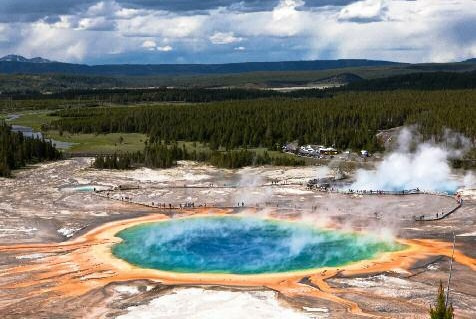 Highlights Include: 3 days Yellowstone National Park Touring, Grizzly & Wolf Discovery Center, Grand Teton National Park, Snake River Float trip, Salt Lake City Trolley Tour, Morman Tabernacle. Safe Connections is a personal emergency response program that offers an immediate response in the first critical moments of an emergency with hands-free, two-way communications. 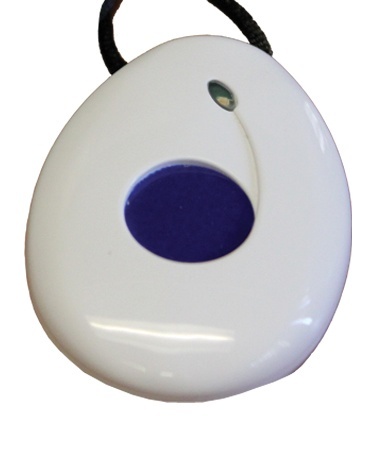 By wearing a waterproof pendant as a necklace or wristband, help is just a push of the button away! Respond to your need through the speaker box. View your profile and assess your situation. Contact family members, neighbors, or emergency responders. Remain in communication with you until help arrives. Your pendant is waterproof and can be worn in the shower. Battery backup ensures you that you are never without service. Most importantly, your Safe Connections system will be delivered and set up in your home by a trained Senior Services Plus, Inc. installer. The best part is that your Safe Connections system will provide you and your family with peace of mind for as little as $1 per day. Don’t wait! Accidents happen every day. Be prepared. Call to schedule the installation of your Safe Connections System today! 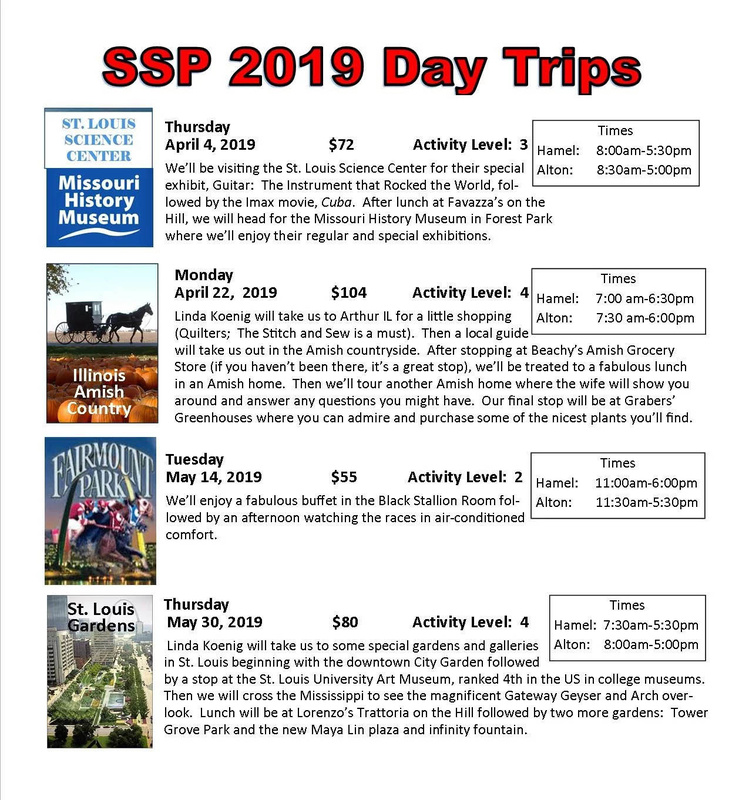 For more information, contact the SSP Community Care Program at 618-462-1391. 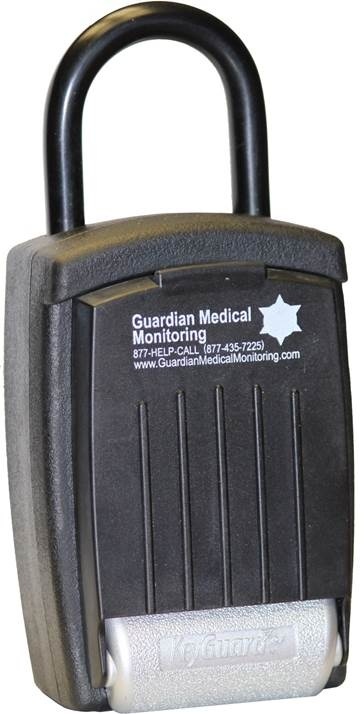 Trusted for more than 80 years, Guardian Medical Monitoring prides itself on a commitment to excellence in providing safety and security solutions to seniors, their families, and caregivers from coast to coast. Guardian Medical Monitoring is dedicated to supporting seniors, families, and caregivers. We understand the emotional, social, and financial benefits of living independently with dignity. Guardian provides the peace of mind that reliable help is always there without the cost of full-time care. When you choose Guardian, you are getting the finest personal emergency response technology, the leader in medication management systems, and Customer Care Coordinators with years of experience. Connects to your landline telephone and works throughout your home and around the outside perimeter of your home. No landline is needed for this cellular-based device. This system works throughout your home and around the outside perimeter of your home. This special pendant can be added to the G4000 or the GSM. 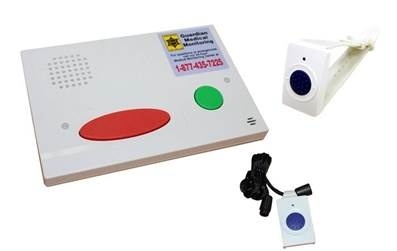 It is designed to detect a fall and automatically transmit a signal to the Guardian call center. This pendant is especially helpful for individuals who suffer from seizure disorders or has a history of strokes. This mobile device is equipped with two-way automated hands-free communication from virtually anywhere via cellular networks. GPS locating can assist in identifying your location at the time of need. This device also features multi-sensor fall detection. It can be worn with a lanyard or belt clip. Allows home access to emergency responders. SSP is proud to now be home to the area Ombudsman program. The Ombudsman program was developed to provide advocacy for seniors and disabled adults who reside in long-term care facilities and is required in each state by the federal government. 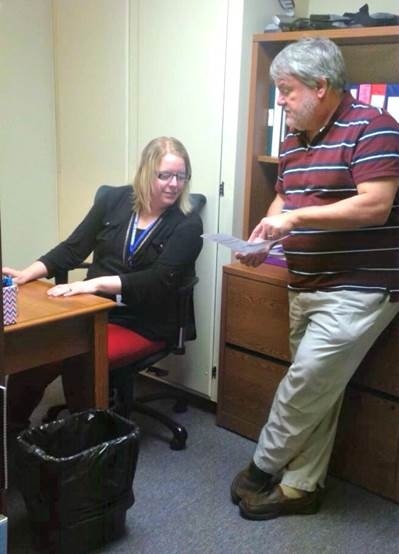 This program helps residents get relief from abuse, neglect, financial exploitation, and inadequate living conditions and gives them a voice to assist them in getting the type of care that they need. This program also works to encourage long-term care facilities to adopt a more resident-centered approach that gives residents more choices and creates a more home-like atmosphere. The Ombudsman program also provides facility and community education, supports resident and family councils, and advocates for legislation that improves the rights of long-term facility residents. At SSP, we cover the St. Louis Metro East counties that include all long-term care facilities in Bond, Clinton, Madison, Monroe, Randolph, St. Clair, and Washington counties in Illinois. We have five full-time Ombudsmen including two at SSP in Alton and two in our Belleville office. For complaints and concerns from residents or others, you can call 800-322-4049 to make a report. To find out more or to see if you qualify, you may visit the Illinois Department on Aging’s website here. © Senior Services Plus, Inc.